Manufacturers of custom bags and custom poly bags, custom printing - Printed bags and un-printed bags. Stand up bags, plain and printed, Stand up foil heat seal bags, zippered foil bag 8 color printed. Vapor barrier heat seal foil bags, vapor barrier laminated materials. Foil bags and foil pouches when moisture is a concern. Vapor barrier materials for packaging. 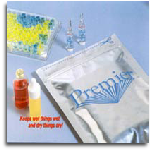 Medical packaging, diagnostic test kits, food, and specialty moisture sensitive products. Foil rollstock and foil web stock - heat seal foil and other custom laminated materials for moisture sensitive packaging - vapor barrier materials - for medical packaging, pharmaceutical packaging, diagnostic test kits packaging, and food applications. Stand up foil bags, plain and printed, Stand up foil bags, with zippers 8 color printed.